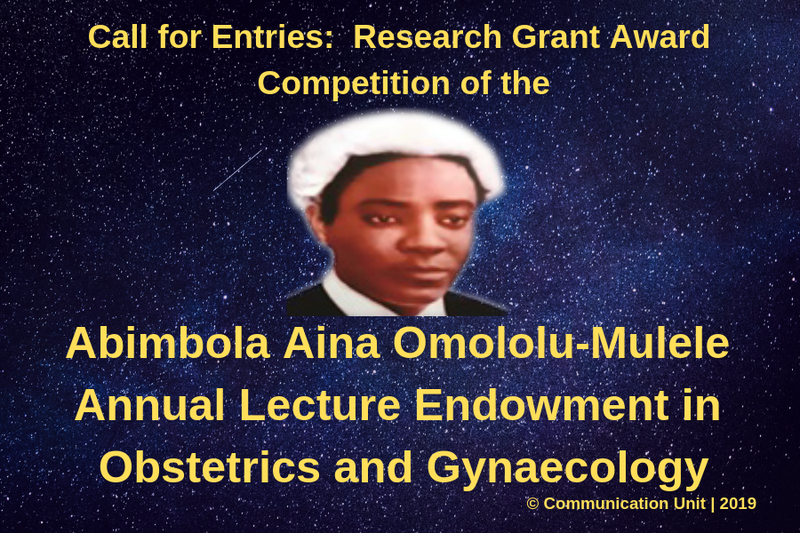 Call for Entries Opens for the Research Grant Award Competition of the Abimbola Aina Omololu-Mulele Annual Lecture Endowment in Obstetrics and Gynecology for UNILAG Staff in 2019 Over [₦3,000,000.00 Grant]. 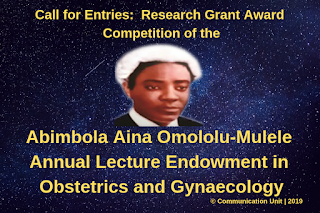 The Board of Trustees of the Abimbola Aina Omololu-Mulele Annual Lecture in Obstetrics and Gynaecology is desirous to encourage research and create greater awareness of the goals and objectivmyes of the Abimbola Aina Omololu-Mulele Annual Lecture Endowment. Further to this, the Board calls for Entries for Research Grant Award Competition in Obstetrics and Gynaecology for the 2019 Edition. The Board of Trustees of the Abimbola Aina Omololu-Mulele Annual Lecture Endowment in Obstetrics and Gynaecology intends to award a limited number of grants yearly to a maximum sum of Three Million Naira (₦3,000,000.00). The Fund is designed for the exclusive use of the applicant’s research. However, the main body of work must be undertaken by the applicant while the non-essential parts may be carried out by other parties. The Trustees main research interest will vary from year to year and this will be made known during the award of the grant. It is expected that the grant will normally be used for the purchase of equipment, services or medical supplies or other related expenses. Under the usual conditions of funding, no portion of the grant may be used for personal expenses such as subscriptions to journals or magazines or the payment of a research student stipend and will not normally be used for the purchase of books. Only in exceptional circumstances, and specifically to aid the furtherance of the research programme, may a portion of the grant be used for travel; details of which must be explicitly stated in the application. Applicants must be members of staff of the University of Lagos. Applications are limited to one per applicant or research group and MUST be submitted through the Head of Department. Applications from early to mid-career researchers are encouraged. Persons employed as research students will not be considered for funding. Applicants carrying out research under supervision are required to have their applications signed by their Supervisor. All applicants will be required to provide the names of two referees (in addition to that of the Supervisor where Regulation 9 is applicable). Normally, at least one of the referees should work in a different institution. Referees should provide a reference that assesses the content of the research proposal submitted. The nature of the research which he/she desires to engage in and the nature of the scientific results expected to follow therefrom. Where the research is to be carried out. The approximate full cost of the research and a breakdown of the proposed spending (expenditure) should the grant be awarded. This should include quantities and approximate costs for each item. What other sources of financial assistance are available (if any) to the applicant for the research; whether these are available in this instance and to what value. Each grantee will be required to provide a report of approximately1000 words on the progress of the research, together with a statement of expenditure. The progress report should begin with a summary of the main conclusions of the research. The report itself should include an outline of the work done, techniques used, results obtained, conclusions reached and a judgement of the success or otherwise of the project, together with prospects for future development. The applicant will be responsible for providing the reports, progress and final, together with a financial statement showing monies received and how disbursed for the general conduct of the research. All papers or publications describing investigations conducted with the aid of the Abimbola Aina Omololu-Mulele Research grant must contain acknowledgement of that fact. One reprint each of such publications should be submitted with the final report as in paragraph 12 above or as soon as possible thereafter. A grant will not normally be awarded to the same applicant for more than two consecutive award years. The Trustees reserve the right to modify the size of the grants in accordance with the sums annually available in the Endowment Fund. The Trustees have the power to alter the above Regulations and to attach any other conditions it may deem desirable. The Trustees reserve the right to withhold the grant in the absence of eligible applications in any year. The Trustees decision is final and applications cannot be resubmitted or reconsidered in the same round. DURATION OF APPLICATIONS: JANUARY 21 TO MARCH 4, 2019. Application form can be obtained >>HERE<<. Click to download. 1 Please give affiliation including department and university or institute. 2 and 3 Digital signatures may be used here. Please see the documentation for your specific software for more information. The novelty of your work. Please provide some background information and explain how you plan to build on this. · If your work is a continuation of a previous piece of work, please outline your previous results and explain what you expect this new work to contribute. What you plan to do. The likely outcomes of your research. Please note that the main body of the research must be undertaken by the applicant (see regulation 3). 8 Please include a copy of your CV. 10 The maximum award for the research fund is ₦3,000,000.00. 12 and 13 Your referees should be able to comment on your proposed project and your previous work to date. 14 Digital signatures may be used here.